“This version has been compiled based on the spelling rules approved by the Cabinet of Ministers of the Republic of Azerbaijan. Dictionary differs from previous editions with the volume and the count of the words. There were 58 thousand words in 1975 edition of the spelling dictionary. But currently there are the correct spelling of 80 thousand word in the new version. This presented spelling dictionary was designed by the employees of the Linguistics Institute of AMEA (Azerbaijan National Academy of Sciences) named after Nasimi. 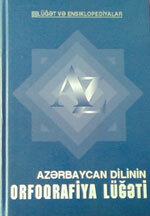 Editor and author of the dictionary is Agamusa Axundov, doctor of philological sciences, professor, member of Azerbaijan National Academy of Sciences. Authors who compiled the electronic version of the dictionary: Professor Masud Mahmudov and Abulfat Fatullayev, c. of t.s.